New Price! 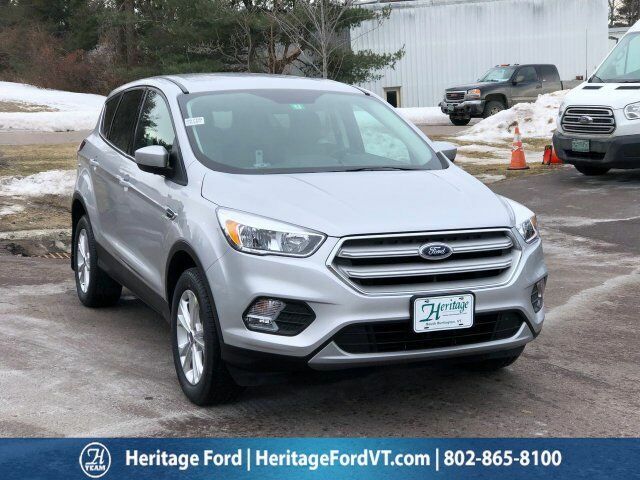 Ingot Silver 2019 Ford Escape SE 4WD 6-Speed Automatic EcoBoost 1.5L I4 GTDi DOHC Turbocharged VCT Escape SE, 4D Sport Utility, EcoBoost 1.5L I4 GTDi DOHC Turbocharged VCT, 6-Speed Automatic, 4WD, Ingot Silver. *$650 lease acquisition fee, $299 documentation fee, $33 title, $5 lemon law fee (new vehicles only), $10 lien fee, $70 registration fee and 6% Vermont state sales tax not included, unless otherwise noted. All state sales taxes and additional fees subject to change for vehicles registered outside Vermont. Ford Vehicles-*$645 lease acquisition fee (when applicable), $299 documentation fee, $35 title, $5 lemon law fee (new vehicles only), $11 lien fee, $76 registration fee and 6% Vermont state sales tax not included, unless otherwise noted. All state sales taxes and additional fees subject to change for vehicles registered outside Vermont. New Hampshire residents pay no sales tax. Toyota Vehicles-*$650 lease acquisition fee, $299 documentation fee, $33 title, $5 lemon law fee (new vehicles only), $10 lien fee, $70 registration fee and 6% Vermont state sales tax not included, unless otherwise noted. All state sales taxes and additional fees subject to change for vehicles registered outside Vermont.